Fire season is no fun for anyone. It depletes resources and impacts recreation. But the implications are greater than many people realize. Last year, The Mountaineers advocated for the Wildfire Disaster Funding Act - legislation to treat emergency wildfires like natural disasters to funded through the disaster programs rather than the Forest Service’s budget. We shared how wildfires impact outdoor recreation and how we engaged as an organization on the issue in 2015. The bill has lost momentum in Congress this season due to lower fire predictions, but fire management is not something we can afford to put on the back burner. Recently, Mountaineers staff attended a webinar entitled "Fire and Drought: Legal Implications for Washington State" to better understand the issues we face as recreationists and advocates for protecting the water and lands of Washington state going forward. Together, these conditions create exponentially more fire danger and thins available resources to suppress these conditions. These changes are leading to larger fires, and sparking discussions about sustaining our water and power supply in drought conditions and fire management strategies. See e.g., Seattle City Light Seattle City Light Climate Change Vulnerability Assessment and Adaptation Plan at pages 47-48. The smoke management policy that the DNR is enforcing was last revised in 1998 - nearly 18 years ago. Our climate is changing, and our policies should be in alignment with current environmental trends. The increase of mega fires means it is time to take a deeper look at prescribed burning and sustainable fire management in the state. Prescribed burning won't fix everything, but when done under favorable weather conditions, it has far less impact on recreation and is effective at reducing larger-scale fires. We were excited to see Governor Jay Inslee sign legislation this April directing the DNR to conduct a pilot policy of "forest resiliency burning" in forests east of the Cascade Mountains. In coordination with other agencies, these efforts would evaluate the effectiveness of prescribed burning and its impact on air quality. 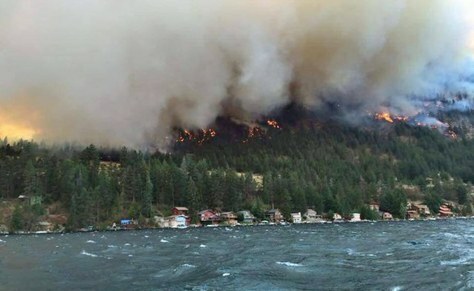 Comprehensive legislation like the Wildfire Disaster Funding Act, introduced at the federal level, is a good step in the right direction toward preventing the the 2015 fire season - where more than 304,000 acres burned just as part of the Okanogan complex fire, our largest in Washington state's history. As recreationists, we need national attention on this issue. Climate change is impacting our water and power supply. The conditions contributing to larger fire seasons are also creating predictable periods of drought, influencing energy consumers. For this reason, Seattle City Light is taking fire very seriously. It can destroy infrastructure like power lines, and drought conditions can seriously impact a power supply that's 90% hydropower. In the winter, lakes created by dams will be bursting at the seams. This will require utility companies to release pressure on the dams (with no energy production) to ensure the stability of the structures and prevent catastrophic flooding. In summer, less water will be available to produce energy and maintain downstream fishery populations. This will require utility companies to purchase power on the wholesale market, which could increase prices for consumers (Presentation by Crystal Raymond, PhD., Climate Adaptation Specialist for Seattle City Light). As we deal with drier and hotter summers, increases in forest fire activity can interrupt power production (because workers need to be taken out of harm's way and/or lines go down in the fires). This leaves communities in the dark and passes on higher costs to consumers (from repair expenses and the purchases of power on the commercial market). As the "normal" cycles impacting our hydroelectric power grid change, the "trickle down" effect touches everything: salmon, energy consumers, the fish market, firefighters, utility workers, and outdoor recreationists. Our fire policies have massive impacts on a number of communities. Our utility operators and some of our government entities are taking the issue of wildfire seriously, but we want to keep this conversation going and we want you as a recreationist to know why this is important. While a wildfire may seem concerning only while it is burning, the economic and environmental ramifications last for years. 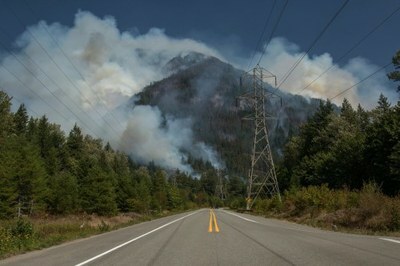 Together, as people who enjoy the outdoors and use basic utilities, we can inform ourselves about wildfire impacts so we can influence the DNR and Congress so they feel the common demand from every affected constituency and take the actions necessary to preserve the outdoor experience, protect consumers, minimize costs to taxpayers, and protect wildlife.